Since 1983, SAVOR has been providing food and beverage services to a wide range of public facilities across the United States and in Europe and Mexico. Key to our operating philosophy is to consider each venue individually, remaining flexible to specific needs and responsive to regional preferences. The ongoing excellence of our food and beverage services heightens your patrons’ enjoyment of an event and provides an important revenue source for your facility. 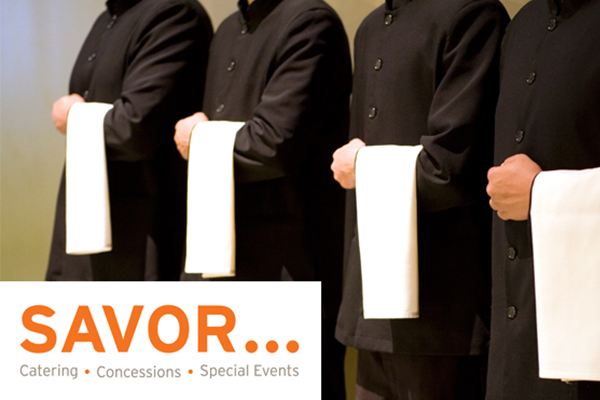 SAVOR offers a broad menu of services tailored specifically for the needs of each facility and the types of events and crowds each attracts. We have extensive experience catering every type of occasion, from cocktail receptions and buffets to trade show exhibitor entertaining and large sit-down dinners. Our retail food program, which includes food kiosks, concessions, restaurants and cafes and portable carts, offers convenient options for the “grab-and-go” crowd and captures more revenue per square foot for our clients. SAVOR is an industry leader in introducing green standards and programs to public facilities. As the food and beverage provider to facilities with some of the most stringent environmental policies in the world, we have researched the matter extensively and have worked closely with the community and facility managers to develop environmentally friendly operations. Initiatives aimed at minimizing our carbon footprint include banning polystyrene foam products from all facilities, purchasing locally produced and sustainably raised products, sourcing sustainable seafood, using non-petroleum-based products, and recycling and composting our waste whenever possible. At San Francisco’s Moscone Convention Center, SAVOR has risen to the challenge of becoming 100% green with trailblazing zero-waste programs that range from biodegradable eating utensils to composting kitchen scraps. Our experience and knowledge of green practices position us to conduct facility audits and recommend ways to reduce environmental impact. As such matters come more to the forefront of community concerns, SAVOR is qualified to help phase in initiatives that will not disrupt the flow of operations or impinge on the bottom line. Our existing alliances and familiarity with environmentally responsive sources also enable us to help facilities scale up quickly. In addition, clients can count on SAVOR to introduce green innovations as their efficacy is proven.